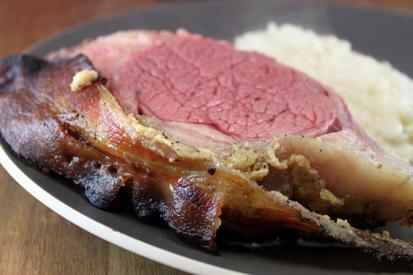 Bacon wrapped dijon & rosemary prime rib! Today is National Prime Rib Day and there could not be a better way to celebrate than with this delicious roast! Season beef with salt and pepper, including the rack of bones. Rub mustard all over beef; sprinkle with rosemary. Wrap with applewood bacon. Let it marinate overnight. Remove beef from refrigerator a few hours before you are ready to cook. Preheat oven to 450. Roast the beef rib side up 20–25 minutes. Reduce temperature to 325°; continue roasting for two more hours, or until a meat thermometer inserted in the center registers 120. Transfer roast to a carving board and let rest for 20 minutes before carving.